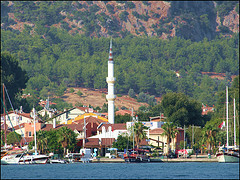 Arrive at Fethiye Harbor early in the morning. Fethiye, which was known as Telmessos in the ancient times, was the most important city situated on Lycia's western border with Caria. It is believed that the city's name comes from Apollo’s son Telmessos. As the name suggests, the city was the city of light and was famous for its prophets. We also offer the option of a jeep safari tour in Fethiye. For those who will not join the Safari, the boat will cruise to Samanlik Bay for lunch and swimming. Afterwards around 16:00 the boat will anchor at Ece Saray Marina for dinner and overnight stay. 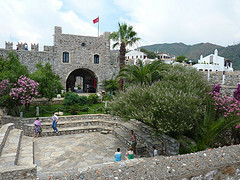 Our guests who have joined mini tour from Marmaris will disembark here. The new guests for mini tour must embark the boat at 09:00 a.m. from Ece Saray Marina. 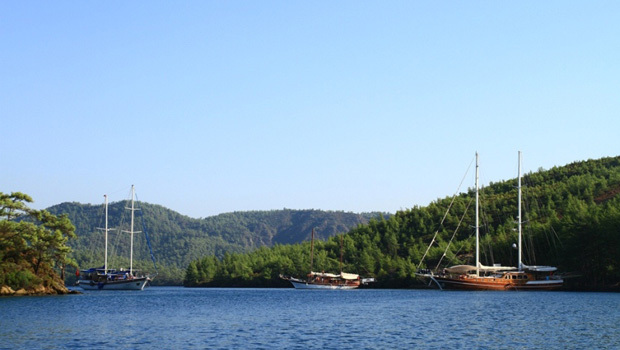 After breakfast, depart from Fethiye Harbour for Gocek Island. While moving through uniquely beautiful islands, we finally anchor at Yassica Islands. Lunch will be taken in this beautiful chain of little islands. Snorkeling in the crystal clear water is recommended. Dinner and overnight in a bay amongst the islands of Gocek. Cruise starts early in the morning and the breakfast will be served in the bay of Kumlubük which lies within the sight of Marmaris but is cut off from it by a forbidding set of Limestone Mountains. You will have afternoon tea in a nice bay of Cennet Island. Overnight stay will be at Marmaris Harbor.